– Walter Issacson quoting Steve Jobs in his biography, Steve Jobs. Brainstorming is a creative and exciting process. People get together, think about a problem, and come up with ideas and solutions. When it comes to your job search, you want to brainstorm with a lot of people and you want those creative juices flowing. Good networking involves a process of in-person interactions with many people who are in the realm or the industry you are trying to learn more about so that you can move forward in your search. You need to find out what is going on in the industry you want to join so that you can navigate your search and move closer to your goals. Where is the work and why is that sector busy? What are the trend lines? Who is at this particular company or firm you think could work for you? What credentials are valuable in a particular niche? Which workplaces have experienced growth? With your current skill set where could you fit in? If you wanted to move into another niche, what additional credentials would help you? Who else could you meet with to learn more? If you are already part of the professional community in which you are conducting your search, and you want to transition within it, you need this kind of brainstorming and information about places that are busy, active, growing, and where people report that they like working there. To be sure that your efforts pay off, you have to meet in-person for the same reason Jobs talks about when it comes to creativity generally; you are trying to ignite the person you are meeting with to percolate or bubble up with thoughts both for you and with you to help you learn more. The simple act of telling everyone your dream and dilemma in in-person meetings or get-togethers can jump-start your success at not only hearing about opportunities, but landing them as well. When you meet in person, you engage another human being one-on-one, which helps you to create trust and friendship. The mixture of trust and friendship together are a powerful cocktail that might help you to be endorsed to the workplace by the person you are meeting with. 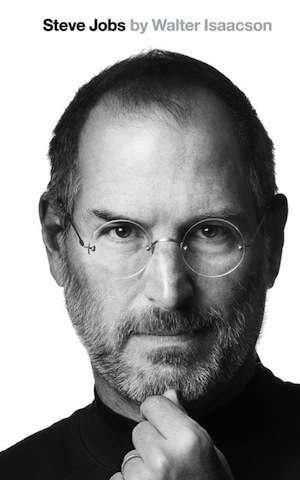 Steve Jobs was right not only about creativity in the workplace but creativity to gain access to a workplace. Why Go on a Job Quest? 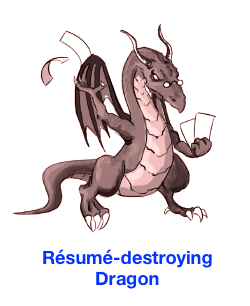 I teach people how to look for jobs and other opportunities using a new approach – namely, a Job Quest. This approach uses game board imagery and a medieval quest analogy, complete with knights, wizards, and dragons. Why does this help? People who have a game plan, road map, or blueprint have a better understanding of what they should be doing. They have more targeted goals and drive towards achievement of their goals more effectively. Without the game plan in mind, many people rely instead on a “tool box” approach for their searches. They open the box – “Today I’ll try LinkedIn, or recruiters, or I’ll check job postings on Craig’s List.” That approach is not wrong, but it’s usually less productive because it is more scattershot and not embedded in an overarching strategy. Seek out the “wizards and knights” (natural counselors) in the woods and articulate his dream and dilemma and core message. Set up in-person meetings with key people in the realm in which he is seeking to work because more magic happens in person. Develop authentic relationships because trust transfers from the wizard or knight to him. Outsmart the “dragon” at the castle gate by coming in the side door or back door through a trusted contact – wizard or knight – with an endorsement if appropriate. Do good deeds and help people out without expecting anything in return because what goes around comes around, and because generosity is crucial not only for a successful job quest but for a successful life. Authentic relationship building is a skill and an art that is best done in person. As you practice more, you get better at it, just as you improve at basketball when you practice making shots. Done well and done with emotional intelligence, relationship building is the bedrock foundation for a successful career. When relationship building is used for job search, the seeker hears much more gossip and on-the-ground market intelligence. The job seeker can also figure out how to give back to his contact, and how to find a way to make life a little better for this person who has brainstormed with him, shared his intel, and helped him to connect with others in the realm. 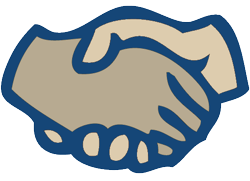 People in sales understand the importance of in-person meetings to create and solidify relationships. When you search for a job you are also in sales – you are selling yourself through a series of mini-interviews or vetting sessions. You really never even need to ask your contact, “have you heard of any jobs?” because the person you are meeting with understands that a job is your ultimate goal and that you need information and advice to achieve your goal. Armed with game board imagery, a job-seeker can clearly understand that to advance in this game, she needs to identify the castles (workplaces), seek out knights and wizards (natural counselors) in the realm (industry) she is trying to get into, work her way to the castles that are good matches given her current skill set and the market need, and evade the dragons who guard the castles (human resource people and software scanners) by coming to the attention of the castle staff via a trusted contact, ideally with an endorsement. There is a skill set match between what you offer and what the workplace needs. The workplace needs help – it is busy, active, and growing. The culture fit is likely to be good – people already there have backgrounds and work histories that are similar to yours. You can come to the attention of the workplace through a trusted contact who likes you enough to endorse you to the castle staff or the key keeper (person in charge of the hiring decision). Games are fun. Once we understand the game board, the rules, and the overarching concepts to employ in a job quest, the “work” in networking disappears. Check out my new book to find out more about how you can start your own job quest! How aggressive or vigorous should you be in your attempts to contact people inside a workplace if you think those people could really help you with an endorsement but you do not have a strong personal connection? These days there is a lot of questionable advice and some real confusion about how job seekers should maximize their networking efforts using online sources of connection. Some articles suggest that job seekers should identify prospective workplaces that have job postings and then use LinkedIn to find people who currently work there with the aim of contacting them to ask them to forward their resume to the “right people” and put in a good word for them. The problem is that if you take this approach, you risk creating a negative impression. Instead of gaining an ally or getting a positive boost for your candidacy, you could be perceived as clueless, desperate, boorish, or overly aggressive. Instead of getting the endorsement you want, you could damage your search efforts. If you have ever been on the receiving end of such a request you understand that anyone who asks you to vouch for him within a workplace is asking you to put your own credibility on the line with the people in charge of hiring. You need to know, really know, the person you are endorsing, and a connection on LinkedIn might be a start but it is not enough to gain trust. The reason why some people are tempted to try this approach is that most of us understand that jobseekers who are recommended by people inside the targeted workplace gain a tremendous advantage. Thomas Boyle, director of product marketing at Silk Road, a talent management solutions company, says what so many already suspected: “It is still about who you know. It shouldn’t be a surprise to anyone that employee referrals are the number one source (for hiring).” (As quoted by Jacquelyn Smith in her Forbes Online article, “New Research Shows Where Employers Find Their New Hires.”) If you can come to the attention of the workplace through a trusted contact , namely, a person known and credible to the workplace, and if that contact says good things about you, your chances for getting hired go way up. About 60% of new hires are recommended by internal sources, according to a Silk Road Report on sources of hiring. How can a job seeker gain the trust of people who work inside a particular workplace? The answer is you cannot do it immediately and you cannot do it remotely. But just because you do not currently know people in a targeted workplace does not mean you are precluded from relationship building with a goal of developing authentic connections inside that and other workplaces that your research reveals could use your skill set and experience. The answer lies in a process I call rapid relationship and trust building. It is something I have learned about through my career counseling practice with the hundreds of people who have worked with me. Some people I worked with were outstanding at relationship building and others struggled with it. But as I have watched and coached so many people over the years, I could see that the naturally gifted networkers were engaging in a certain kind of relationship building, and sometimes doing it remarkably quickly, to open up possibilities that resulted in jobs. They were creating and deepening friendships that led to greater good fortune. I was able to study and understand this process because of the number of gifted networkers I counseled and the fact that I could ask probing questions about how they did what they did, who they met with, and what they said to open up opportunities. 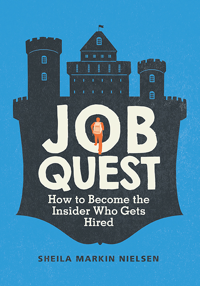 I write about this approach to job search in my new book Job Quest: How to Become the Insider Who Gets Hired. The approach is predicated on authentic friendship and generosity. It is not all about you getting a job, in other words. A better way to think about productive networking for a job is that it is about you, at least in part, adding value in your industry, field, or specialty. What the naturally good networkers are doing is asking for help to understand the lay of the land, learn the gossip, rumors, oral history and on-the-ground information about what is happening in the targeted field or industry. They are learning about workplaces that are busy and active and growing and good places to work. They are not using the “J” word too soon (jobs). They are giving to others without an expectation of a quid pro quo return on the investment by creating connections for themselves and others, and giving people gifts of information, support, help, opportunities to promote themselves, and small tangible gifts when appropriate. The attitude is different. The mindset is different. And the result is a series of in-person vetting meetings (breakfast, lunch, dinner, coffee) with key people who size up the candidate and report back to the workplace or notify other people in the industry who might like to meet this person. Emotional intelligence is very important in this process. Part of emotional intelligence is realizing that it is likely to be offensive if you ask for an insider advantage without having a relationship that supports an endorsement. Endorsements are the result of personal knowledge and they usually have to be developed in person. The best endorsement is one where the person knows you, likes you, knows your work and work ethic, knows someone inside the workplace, and is happy to vouch for you. But even if the person only knows you and likes you, and knows someone inside the workplace and is happy to vouch for you, that more limited endorsement can still be very helpful for a jobseeker who would like to be invited in for an interview or a vetting meeting with a key person or people connected to the workplace. I have seen good networkers create opportunities through this process of rapid relationship building that have led to endorsements behind the scenes at the workplaces that resulted in job offers. Those doors would not have been opened if that jobseeker had used a direct assault without an authentic personal connection. Most people think of networking as a necessary evil. They don’t want to do it but they know they are supposed to do it. Networking is also mysterious. How does meeting people turn into a job? Just how does that work? Most people are confused about how to network effectively. When people network to find work they usually tell their contacts that they are looking for a job, and ask whether the person has heard of anything. That seems like the right thing to do. If you are looking for a job it’s logical to ask people if they have heard about any in your industry. And sometimes the person has heard of a job and will tell you about it. But more often the person isn’t aware of job postings because he is not looking for a job himself and if he is, you will be the last person to hear about his leads! People who are working are busy. Even really nice, helpful people are not going to devote time and effort to do your search for you. So when a job seeker says “Have you heard of any jobs?” the standard reply is, “No, but if I do hear of anything I will contact you.” That is the end of the conversation. Often it’s a dead end. The usual way contacts handle a job seeker who wants to talk about where the jobs are is to tell him or her to look at job postings. There are many search engines and the jobs posted there can appear to be very juicy. Job seekers often spend a lot of time and effort putting together the right resume and cover letter to try to get in the door for an interview using these online portals. But it turns out that that approach has serious problems. Online portals are often disappointing when it comes to actually landing a job. Turns out only 2.1% to maybe 4% of jobs are landed by people who apply online using search engines. I have worked with many disillusioned job seekers who have applied to hundreds of postings and gotten nowhere. Many say, “I feel like I am sending my resume into a black hole.” And it turns out, they are right about that. Eighty percent of jobs are never advertised. Many companies use talent management software to screen resumes and about fifty percent of the applications are weeded out before a human being reviews them. Internal sources of hiring are the best way to find work. Sixty one percent of hires are referred by internal sources (employees) and twenty six percent come through a job posting on the company website, but they might also be getting a boost or endorsement from someone inside the company or another person who is known and trusted by the workplace. Seventy percent of jobs are found by networking, according to the Bureau of Labor Statistics. What is the take-home lesson? The insiders are getting the jobs. By insiders I don’t mean people who get unfair opportunities because daddy pulled the strings. I mean people who have the right skillset and either already have or create a relationship with someone known and trusted by the workplace. In addition they often earn an endorsement from that person by making a positive impression. And by endorsement I do not mean the kind on LinkedIn, although LinkedIn is an invaluable resource for job search in many ways. No, the insiders are people who conduct their networking in a different way. I found this out by counseling over 3,500 people in transition. Many of them were looking for jobs and others were trying to transition to new fields. In my work with them, I learned there were gifted networkers who landed job opportunities through a process I term rapid relationship and trust building. It has to be done in person. It has to be informed by good research, preparation, and emotional intelligence. And it works best if it isn’t just about you getting a job. The secret is that outstanding networkers engineer luck and also create a positive buzz about themselves in the process of their job searches by connecting others, being helpful, generous, and good listeners. In the process of helping other people they learn the lay of the land, hear the gossip, and get invited into a work setting with an endorsement that helps them stand out from the pack, circumvent the software scanners, and get the all-important interview with a cherry on top – an endorsement from someone who met them in person for a mini-interview (breakfast, lunch, dinner, coffee). This kind of networking is not networking as usual. You don’t use the “J” word until you know of places where your skills match up with the needs of the workplace and where you are likely to be welcome. You might think that it would take a long time to develop these kinds of connections with people, but in fact this kind of relationship building can often be done quickly and effectively if it is done in the right way. This approach is the fastest way to get a job. I teach this method to all of my clients looking for work and it really helps them. 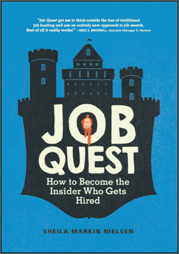 If you would like to learn more about this new method for job search, check out my book, Job Quest: How to Become the Insider Who Gets Hired. It is available on Amazon; click here for more information on the book and to download a sample chapter.